It’s that time of year again for massive 1-day summer fests hosted by the hottest radio stations in the country!! 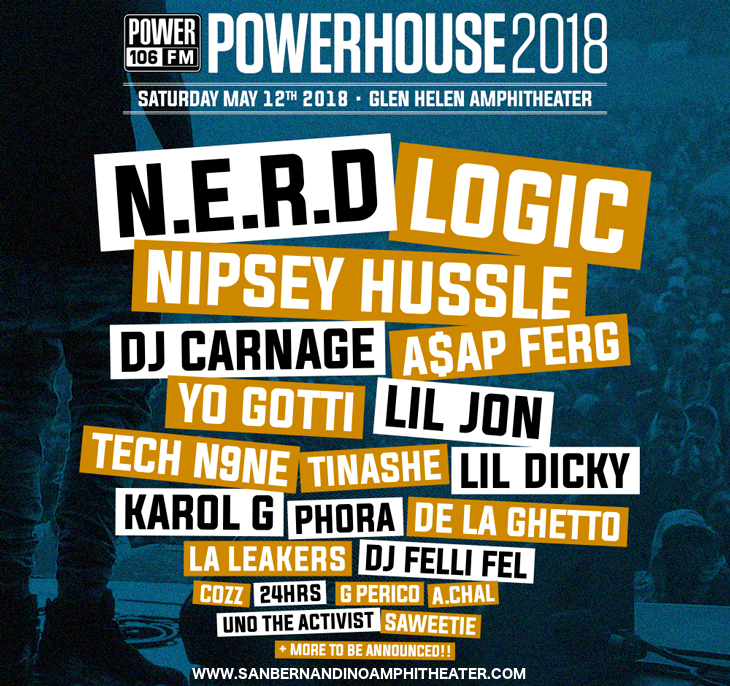 This year, Los Angeles’ Power 106 is proud to present Powerhouse 2018 – featuring huge headlining acts N.E.R.D, Logic, and A$AP Ferg among many, MANY more of the biggest names in hip-hop, with more yet still to be announced!! It’s going to be a truly epic event! Get your tickets now before they sell out and bring water and a lot of energy on the day – you’re going to need it!! The festival will have two stages and a festival area. The biggest acts will perform at the main stage, while the New @ 2 stage will host performances from the hottest up-and-coming names in hip-hop. The festival area will offer a host of activities including psychic readings, games, body painting, graffiti artists, fairground rides, and a range of food and drink as well as the Power Party DJ tent. The line-up so far includes N.E.R.D., Logic, Nipsey Hussle, A$AP Ferg, Lil Jon, Carnage, Yo Gotti, Tech N9ne, Tinashe, Lil Dicky, Karol G, De La Ghetto, Phoro, L.A Leakers, DJ Felli Fel, Cozz, 24hrs, G Perico, A. Chal, Und The Activist, Saweetie, and the recent addition of MIGUEL! It’s going to be a day of non-stop music you’ll remember for the rest of your life – so don’t delay, get your Powerhouse 2018 tickets TODAY! !